Olivia, baby girl, please stick with the cronuts and bagels and stay out of trouble. Please. 2. Coney Island - I know you want to go to Coney Island - and I fully support this - but here’s the recommendation I’m going to make that you’re not going to like: go on the Cyclone. It’s old, it’s rickety but it’s an institution - try to enjoy it! Go through the haunted house, ‘Spook O Rama’ if you have the time too. Also, grab a hot dog from Nathan’s Famous - famous for hot dogs, you can’t not get one. 3. Rent a boat on The Lake - it’s cutesy and fun. Rent a boat on The Lake in Central Park and take in the scene from the vantage point of an adorable paddle boat. 4. Walk over the Brooklyn Bridge - Walk over the Brooklyn Bridge, take in the sights of the city and when you get to the other side (the Brooklyn side), reward yourself with pizza from Grimaldi’s Pizza. Cheesy and delicious - go pepperoni for sure! 5. The Natural History Museum - Dinosaurs. Need I say more? But while you’re there make sure you go to the Space Show: Dark Universe and have your mind blown. It’s a film experience and it’s narrated by Neil deGrasse Tyson - you’ll love it. My first cronut. Haven't looked back since. 3. Hot Dog - There are good hot dogs all over New York. There are classic dogs like Gray’s Papaya which are tasty and a bargain - get the Recession Special: 2 hot dogs and 1 drink for $5.95 and Nathan’s Famous hotdogs (a Coney Island institution) - but then there are experimental dogs that are a league above the rest. Warning: This is not for the faint of heart Olivia, be prepared for artery-clogging deliciousness that you cannot get anywhere else. 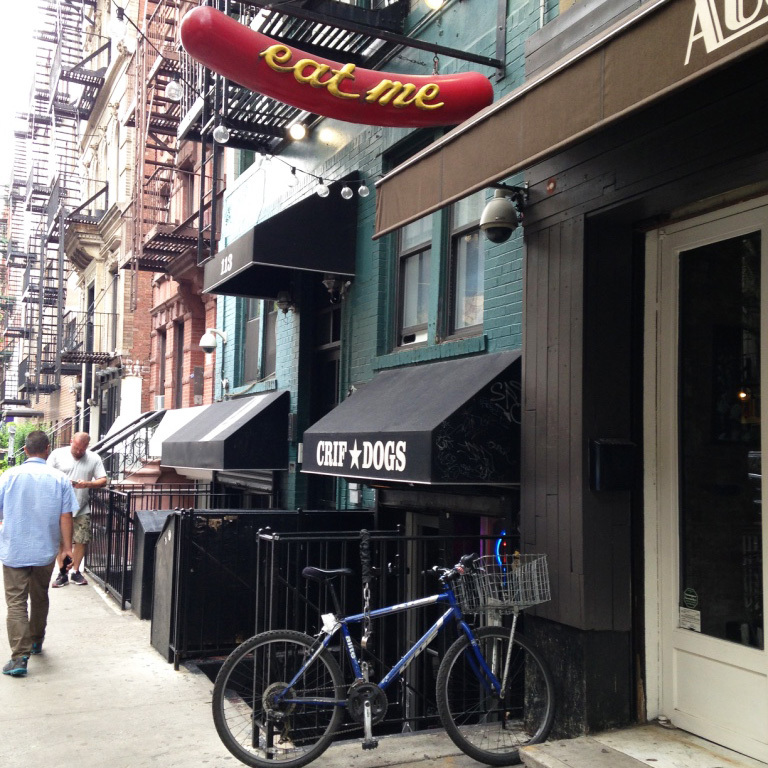 Crif Dogs, East Village. Deep fried hot dog with bacon and avocado. That is all I have to say. Enjoy. 4. Pancakes - Epic pancakes await you at Clinton St. Baking Company. These fluffy stacks of pure joy won’t let you down. Get the ’Pancakes with Warm Maple Butter’. I advocate for the blueberry topping but you can decide between blueberries, walnut and banana and chocolate chunk - but above all else, stay hydrated, you’re going to need all of your reserves to pack this stack away. 5. Pie - For all of the indulging I had done, I still felt that my trip to New York would not be complete without pie. And after enjoying the pie at Little Pie Company, I’m pretty sure I was right. I can’t even remember the type of pie I ate, all I remember is the joy. I was dripping wet from the unexpected rainfall (that was fun…) but all was well with that pie in front of me. My trip (and yours Olivia) will not be complete without pie from Little Pie Company. Seriously. Eat the pie. Five Napkin Burgers in Hell’s Kitchen - Be sure to go there hungry. You’ve been warned. Shake Shack - Obviously great burgers but head to Madison Square Park for a burger with a view of the Flatiron. Burger Joint - If you feel like a burger that’s trendier than you are, this tasty morsel is hidden inside Le Park Meridien Hotel - walk inside and go left at the reception desk. Each of these burgers will leave you feeling satisfied to be sure, but none can compare to the striking genius of the Minetta Burger at Minetta Tavern. The entire menu at Minetta Tavern looks divine but don’t be distracted, keep your eye on the prize and get the burger. 7. Ramen and Bao - By some miracle there was no wait when I visited Momofuku and I had the privilege of enjoying the most delicious bowl of ramen and tasty bao almost immediately after arriving. I was feeling pretty under the weather when I arrived and I’m fairly sure their ramen cured me. It’s pretty much magic. Magic ramen. Seriously good, you’ve got to try it. 8. Banh Mi - There was a decent wait at Saigon Shack but the banh mi was reward enough. I have to admit, I was crazy hungry and with each passing minute I was getting closer and closer to walking away but thank goodness I didn’t because: S.S Classic Banh Mi. You don’t get a 4.5 star Google rating from 434 reviews (as well as 4.5 stars on Trip Advisor) if you’re not doing something right. 9. Yum Cha - I left Nom Wah so full, it hurt. But the good kind of pain - the dumpling kind. My recommended dishes include sticky rice, shanghai pork dumplings and egg rolls (when in New York…). 10. Cupcakes - A New York institution, you can’t pass Magnolia Bakery without taking a light and fluffy cupcake with you. Red velvet is the way to go. 1. The MoMA - At The MoMA you can find such world-renowned works as Van Gogh’s Starry Night, Salvador Dalì’s The Persistence of Memory, Frida Kahlo’s Self-Portrait (in fact there is a whole Frida Kahlo collection), Pablo Picasso’s Les Demoiselles d'Avignon, Andy Warhol’s Gold Marilyn Monroe and walls of Claude Monet’s Waterlilies. And SO much more. Please go, please. 2. The MET - Go beyond the Gossip Girl steps and enter The MET and view a whole host of incredible paintings and sculptures - but I know what you’ll really want to see is the Egyptian collection: ‘The Met collection of ancient Egyptian art consists of approximately 26,000 objects of artistic, historical, and cultural importance, dating from the Paleolithic to the Roman period (ca. 300,000 B.C.–A.D. 4th century)’. It’s pretty amazing, you’re going to insist on seeing this. As a bit of a bonus, there’s also a lovely rooftop bar with a view of Central Park. It’s not terribly high, so your vertigo shouldn’t be a problem. 1. Top of The Rock - without a doubt the best view of New York City. 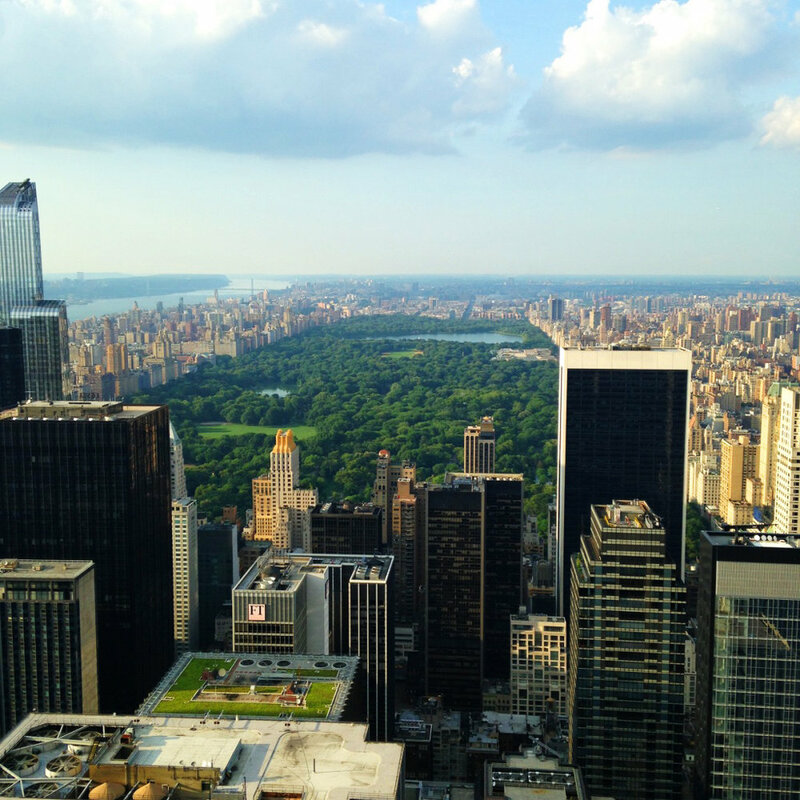 From The Top of The Rock you can take in the grandness of Central Park and the always dazzling Empire State building. Go just before sunset and watch as New York City is bathed in the warm orange and red hues of the setting sun - sounds good right? You can do it girl! 1. The Frying Pan- Drinks on a boat with a view of the Hudson - a perfect sunset viewing opportunity. 2. The Standard Le Bain - Le Bain is a penthouse discotheque and rooftop bar at The Standard Hotel and it’s as fancy as you would expect a cocktail bar to have to be to have welcomed the likes of Beyonce and Jay Z (and Solange - remember that infamous in-elevator security footage?). My advice? Head there just before sunset and enjoy the view with a fruity cocktail in one hand and a camera in the other. There’s also a jacuzzi on the dance floor - bring bathers. 3. Top of The Strand - Drinks and a view of the Empire State Building. I’m certain there are loads of other great rooftops on which you can purchase a delicious (albeit overpriced) cocktail but this view was pretty spectacular. 1. The 911 Memorial and Museum - It’ll break your heart but it’s important and you’ll be glad you went. So, this is my ultimate New York list. 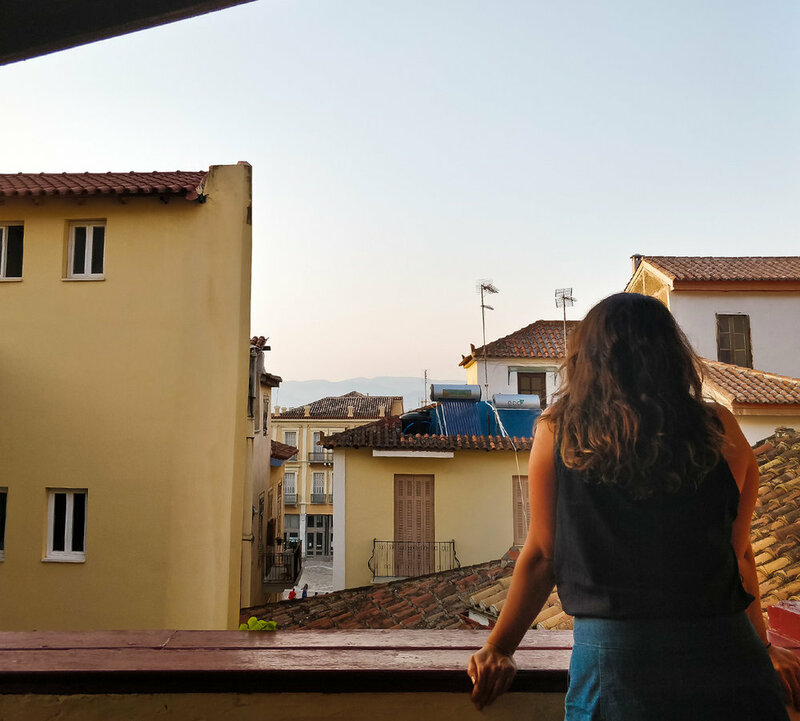 Of course there is so much more that you can do Olivia - including (but not limited to) musicals, live music, shopping, picnicking and about a million other galleries and museums - but these are my top picks. I had some seriously great times in New York doing (and eating) all of these things and I know you will too. Have the best time ever! Big thanks to this guy for the snaps of me gracefully munching on burgers, pancakes and what have you and generally being a fool in New York.